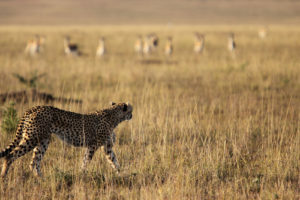 Of course, none of this explains why cheetahs abandon chases early. Perhaps Alan Wilson’s work might eventually provide an answer, using the astonishing collars he developed to track the movements of wild cheetahs. These same collars helped to check another cheetah factoid—the idea that they can actually hit top speeds of 100 km per hour. That was also based on a single artificial study, but to the relief of cheetah fans everywhere, it turned out to be right. Wildcheetahs do actually get very close to that speed when they hunt.